One of the biggest differences I think between living in Mumbai and Chennai was how they perceived a single woman. With a daughter. As far as I remember, even though I left Mumbai very early, life was easier. Less complicated. People did not judge you every single moment. Because, simply, they were too busy leading their own lives to bother about yours or judge how you should live. Somehow in 'conservative' Chennai, it became the purview of every member in the society to teach someone else how to live. Especially the single woman. What is the best way to lead a life. What is the best way to do things. And not quite amazingly, each one had a rank different decision. And from there came these random people advising my mother, on how it is 'wrong' to put me in music. Not normally wrong. But morally, virtuously wrong to make a career in music for a 'daughter'. This was in the 1990-s. Which is why I used to joke that it was a crime to be a single woman and easier to be a widow in Chennai, or at that time, I guess I used to say India. (Now don't come back and criticize me for this line). If I had been a son, there would have been no such perceptions. FYI. But on the flip-side I know a lot of parents telling us they are unable to take such 'bold' decisions because their families forbid them to or in the fear of being scandalized by their own kith and kin. So glad that I wasn't 'blessed' with such a family. I have been blissfully away from most of them. Well meaning advice alright, but this would be from people who had a certain view in life, myopic in some cases, or those who refuse to see a horizon perhaps because the vastness might frighten them. I know not what the reason would be. But then, I will have to also say, that the society then was not kind on innovators, who they loved to call 'rebels' then. You had to do Engineering or Medicine. Nothing else would do. Sad to say that still exists in various parts of India as the right thing to do. A Senior Fellow with the Govt. of India, Dept of Culture, my mother decided to pull me out of school after 8th standard to train me more rigorously in music and make a true scholar of me. (Thankfully my grandfather was well ahead of his times too. Toooo ahead for the 1940-s. But seemed more in line with the 90-s. It was imperative for my mother to ask his permission before anything. Even when he was 93. Yep. The people in my family lived closer to 100. All of them. Thatha would give mom a go-ahead for all her plans). At that time I remember it was impossible to explain "Documentary Film Maker" or Research and Documentation in music. I know of musicians in the Carnatic field who did not know the difference between Archives and Archaeology. This was when my mother was documenting a musician and his life. My the end of that documentary we got a crash course on the musicians in orthodox, conventional god-fearing Carnatic music field. And the main reason why I refuse to sing Carnatic music today. And in the same breath, let me also tell you, that the Film Industry has perhaps more honest and straightforward people than anywhere else, IMHO. Which includes the Carnatic Classical Music field. Veering from the topic a bit, my mother was also my first lesson on Why NOT to share your ideas with anyone. Especially in project proposals. She would write innumerable proposals applying for grants. And from just the synopsis in the proposal, others would poach the idea, with their own limited understanding, pull a few strings and get a grant. A lot of such things happened back then. A dedicated team worked to see what Padmhasini had presented :) Mom took quite a while to find out and as she saw similar projects with the same content as she had presented being worked on by other 'scholars' she saw what was happening and stopped writing to any of these foundations that primarily funded documentation projects in music. And thus did some 'pioneers' come into being. She had devised a truly amazing syllabus and had even spoken to teachers for various classes. Traveled to Delhi several times to see if there was an education system that could aid kids like me. Or a certification for that matter that could take me back to mainstream collegiate education if I wanted to. But no one really knew. And Google was not rampant then. No one knew about the National Open School system then. To people like me and those in sports, it was a total boon. I remember the principal of NOS telling me that a lot of classical musician's kids in Delhi studied through this system. Because really, no conventional school had the concept of identifying a talent other than the numbers on the report card. Be it sports or music. Hindu Senior Secondary, in Indira Nagar, and my principal then, Mr Venkatachalam was a class apart. He was a visionary. I remember him allowing a classmate to come late to school every day, because the boy's father had taken VRS and had taken it upon himself to train him in tennis seriously. His special coaching got over only at 11 AM and he would come to school around 11:30 or something. Every single day. I hear he is doing well. And that his brother is a professional player. Forget the names now. After seeing the pressure of 10th std and what I went through, we saw there was no option of kicking Mathematics in the CBSE syllabus. And if I continued school the only option would be to battle mathematics and forget music until I finished 12th boards. Which was not an option at all. Thankfully we discovered NOS and during the time between my 15-17th year I finished studying German at Max Mueller Bhavan, had begun French, some courses in E Commerce and Designing from SSI and NIIT, worked at Carnaticmusic.com for more than a year (loved this experience as I knew how the corporate world functioned and kept in touch with Carnatic music, which I was otherwise losing touch with as I had shifted to Hindustani classical music), dabbled a while at Student Concepts (they had some project they wanted to work with schools, I forget what exactly now. Manoj, who started SC, was a dreamer ahead of the school educational standards and standardized thinking then) won the All India Radio competitions for Ghazal and Hindustani classical music and rigorously practiced Odissi and learned to play the Tabla. I did some freelance German translation shortly thereafter, for the fun of it and to stay in touch with the language. Blue Elephant was unofficially born a year or so later and officially maybe 3-4 years after this. Given a choice, I would have a pulled out of school earlier. To someone like me, conventional school is a waste of time. The West has woken up to home schooling years ago. Those who dare do it. I am not sure whether India would wake up to it or not, but if my progeny happen to show any brilliant musical inclination, I don't think they will be in a conventional school for too long. When my mother stepped into Chennai, I think one of her first projects was this Audio Glossary she did for Aurobindo Ashram. Again something she did free of charge, because she was of this notion that a spiritual organization should not be given a bill. She was too good for her own good. I remember being a part of all the sessions, her recordings with all the front ranking classical musicians today, directing them, the voice-over sessions with P C Ramakrishna. I wish now, if I can have a time machine and go back to record her working. Sigh. She was a fire brand. And people didn't move a muscle. It was hard to get people to work. Ask some engineers/technicians anything at that time, they will say "Its not possible". It frustrated my mom to no end. I now hear some music directors of today complaining of the same thing. Whenever a composer wanted to innovate they would get "Its not possible". I would not like to state who, because I do not have the permission to publish that here. Whereas in Mumbai they were highly open to ideas. Before the time of music videos, I remember mom discussing the concept of shooting videos for music. And the idea was immediately dumbed down. "Who the hell would watch a music and a video?". And just a couple of years later music videos started, peaked and plateaued. The audio glossary mom worked on was released by Times Music as Aalaap. There was another thing here. By the time Aalaap released, which took a really long time between the production in 1990-1991 to its release in 1999, the content she wrote for the glossary was poached by another musician. Who made quite a fast buck even before Times Music or Aurobindo Society could realize what was happening. Somehow the same musicians that worked with mom in the project told her of the duplication. But considering India and Intellectual Property, nothing could be done. And anyway it was the purview of Aurobindo Society. Now however, my mother's work has expanded and swelled manifold, which I intend to bring to publication. May God guide us and bring this plan to fruition. She keeps saying she has so much to give and so much to do. She gave it all up because I had stepped in and become a professional. I still remember Sri Vishwa, telling me when I was probably 12 or 13 "You should be very glad that your mother has not pushed you into this prodigy-sagadhi. You won't understand why I am calling this entire thing a sagadhi now but you will, later". I had sung for him then. My mother did take me to a few doyens, ask me to sing and get their opinion. Whatever I heard the doyens telling my mother was one of the reasons I stuck to my guns of not going to a popular Guru. Why should anyone else get the credit for my mother's hard work and sacrifice? A year or so after my meeting him, Sri Vishwa passed on. But what he said rings true to this day. The word prodigy is used even more freely today. On everyone and anyone. Mostly on those who don't deserve that tag. Not only from him, but from several other stalwarts have I known that a prodigy must be safeguarded and carefully groomed for several years before put on stage. Not be on display from channel to channel, stage to stage and show to show. So many of the doyens my mother knew and has worked with have passed on. Mrs Sulochana Pattabhiraman, Sri K S Krishnamurthi, Sri Vishwa, Smt D K Pattamma (who always saw a daughter in mother. I still remember mom saying I was taken to meet her when I was but a few days old). 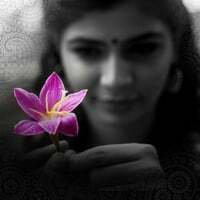 Somewhere down the line, from being known as Chinmayi, Daughter of Padmhasini, Padmhasini came to be known as the mother of Chinmayi. And now its perhaps time to bring my mother out from her professional sabbatical. A beautiful journey....God bless you and your amma. Very touching and inspiring.What a gumption your mother has!! I have a request to your mother.she stopped blogging long time back and I really really wish she starts writing again. IMHO, This is the best blog post from you! I am heading to read "Untitled-2"
It is still hard, chin. I get questions when I talk only about amma. I will probably have a post on this nature after a few years. Hugs and wishes to you and your amma. Lovely words. "And the main reason why I refuse to sing Carnatic music today"
When you wrote that, I am sure you obviously knew that Carnatic music is not the loser. I think its pretty immature to bad mouth a genre of music and decide not to sing that music based on just what your mother experienced with some of the practitioners of the music. And today more youngsters want to learn Hindustani classical music than Carnatic. Fact. Well ! the discussion was not about which one is more popular amongst today's youngsters. Comments coming from a supremely talented musician like you should not deter anyone from pursuing one type of music or to get an "opinion" if you will. Also, your comment - "And in the same breath, let me also tell you, that the Film Industry has perhaps more honest and straightforward people than anywhere else, IMHO. Which includes the Carnatic Classical Music field"
I think you probably have to think twice before uttering such blanket statement. Its pretty demeaning and damaging and does not serve any purpose for what you wanted to convey. I'm sorry if you think I am questioning what you think and blog about. Only because I feel that such words can do more harm than prove a point. And if they had to be deterred, then I would safely say they could stand deterred by the film Anniyan, where the director portrayed in cinemascope about the politics of the 'Sabha Secretaries'. That line was a response to the general perception that Cinema Industry is 'bad' or not the safe place for people to be. Big bad wolf types. If you know what I mean. True, I agree that politics and issues prevail wherever you go. This is where I commend someone like IR & ARR (or any MD for that matter) who see the best (& worst) of both worlds and continue to use them appropriately and deliver what they are passionate about, which is just music, without being worried about the "baggage" they all come with. With all that said, I have to tell you that this post of yours was brilliantly written :-)!! Mam Really great post and nicely. Everyone must think ant this. Engg and medicine arent the only profession.